Vampire Beauties: Vampiress Review: "Underworld: Blood Wars"
Vampiress Review: "Underworld: Blood Wars"
The Gist: After years of hunting her the vampires are desperate and want her to come back to the fold to help train the next generation of death dealers but a pair of rogue vampires sabotage the reunion. Clarification: At this point in the series the idea of continuity is pretty much thrown out the window. The beginning of these films are not only used as a form of recap but to explain exactly why nothing that happened in the previous films will really be addressed in the one you're about to watch other than having flashbacks as time filler since the actors from those films aren't in it. Basically this continues the vampire snow white story that they keep recycling for the franchise. Selene is the greatest thing since sliced bread and someone is jealous so they frame her so that the vampire higher ups believe she's turned on her own kind and she has to clear her name. Selling Point: Recycled storyline or not it's a pretty good action/adventure franchise. 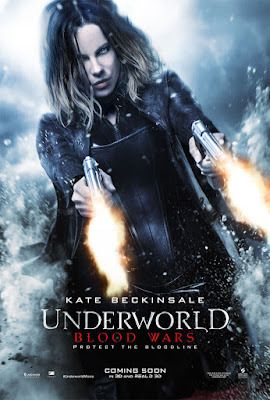 Female Vampire factor: Of course we know of Selene played by Kate Beckinsale. 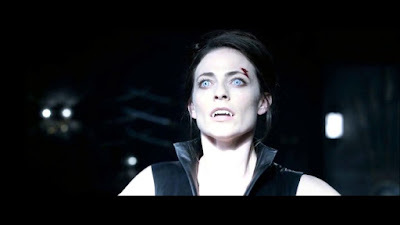 Also with her is a vampiress named Alexia played by Daisy Head who is herself a double agent as she is conspiring against both sides with her lover who is a Lycan which as seen below doesn't get her too far. This film is easily the best use of female vampires in the entire franchise so I'll give it a Vampire Beauty Rating of 4 out of 5. Still more of a Lord of the Rings style fantasy adventure than anything horror related and it still doesn't make sense to me that werewolves and vampires depend on firearms and weapons but it could be much worse. While the film does end with a hint that a spinoff franchise is coming it seems that it will more likely be on the small screen and the Selene story may be over.